Vegan ideas for you and your kitchen. We have a local restaurant in Rhode Island called Jacky’s Galaxy, and they have amazing Thai cuisine. One of my favorite dishes over there is their pad thai. 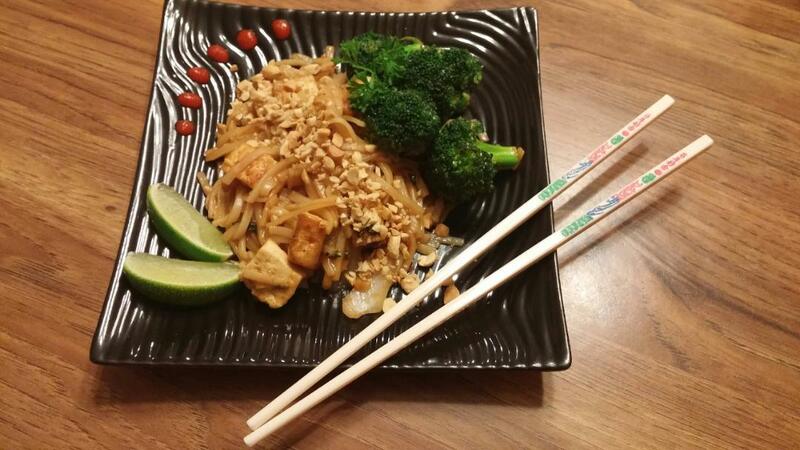 I don’t think anyone can quite do pad thai like Jacky’s, but this comes pretty close. My wife said that this was the best dish to-date, in her opinion. This was a big win, because she’s fairly finicky with her food. Also worth noting, if your not yet sold on tofu, this dish might win you over. It uses it perfect, to absorb the flavors and I found the browning it in the pan beforehand really added a nutty flavor which complimented the peanuts. – Mix all ingredients in a large bowl or measuring cup. Set aside for later. – Start a cast iron pan on medium-high with about 1 tbsp coconut oil. – Add the tofu cubes to the hot pan and sprinkle lightly with salt, allowing tofu to brown on both sides. – Once browned, remove tofu from the pan, and set aside. – Add the other tbsp of coconut oil, and cook broccoli for about 5 minutes. Pan should still be on med-high, so stir often to not burn. – Transfer broccoli to the same plate/ bowl as tofu, and turn the heat on the pan down. – Add garlic to the pan for about 15 seconds, stirring the whole time and add about 1/2 of the sauce from above. -When the sauce is heated and starts to bubble, add the scallions and parsley and cook for a few minutes. – Add the noodles, and toss to coat with the sauce. – Add the tofu and broccoli, top the the remainder of the sauce, and toss again. Serve while hot, topping with chopped peanuts, a lime wedge and Sriracha if you want a little extra heat. This entry was posted in Asian, Dinner. Bookmark the permalink. A little about myself, On June 11th, 2015 I turned 29 years old. Approaching the big 3-0 hit me a lot more than I thought it would. I have pretty much a full head of gray hair, a house in the 'burbs, and a family that I love very much. One thing I didn't have as I approached the beginning of my mid-life, was my health. I decided to go vegan to see where it took me. Since making the change, I've had a few friends as me for pointers and ideas. I thought this blog would be a great source to help them, as well as hold myself responsible and archive what I've done. I hope you enjoy.